I honestly almost posted this recipe over the weekend because I COULD NOT wait to share it with you! In short, we freakin’ love this stuff. And you totally will, too. This is one of those recipes where you’ll take one bite and instantly shout, “Where have you BEEN all my life? !” One that you make for Super Bowl parties, potlucks, or get togethers, and everyone goes, “THIS is HEALTHY? !” One that you will literally not.be.able.to.stop.making. And one that only requires 6 ingredients. I have had crazy-strong cravings for spicy foods lately, so I had to try and healthify, vegetarianize, and gluten free-ify one of my all-time favorite spicy dips! Especially in this next month and a half where everything centers around football. Healthy game day food that tastes just as sinfully delicious as the traditional stuff? Oh yeah, we’re going there. It all starts out with one of my favorite healthy dip hacks – hummus! Hummus makes this Healthy Buffalo Chickpea Dip just as creamy, dreamy, and delicious as the classic buffchixdip without all of the cream cheese/ranch/blue cheese/etc. Pinky promise. Next, ze hot sauce. Technically you can totally use any kind of hot sauce your little heart desires. However. Because we’re wanting this vegetarian buffalo chicken dip to taste as close to the original as possible, I will alwaysalwaysalways choose Frank’s. It’s a classic, and I love it so. Next, for some extra flava, we’ll add some garlic, parsley, and cheese. If you’re dairy free and/or vegan, you can totally leave the cheese out or use nutritional yeast or use a vegan cheese. I added some mozzarella because it’s such a small amount (only 1/4 cup! ), and it really helps to tame some of the blowyourfaceoff heat from the hot sauce. But, to each their own! So you blend all of these ingredients together, pulse in some chickpeas, and bake for 20-30 minutes, and you’ll be greeted with the tastiest, creamiest, most flavorful vegetarian buffalo chickpea dip ever. Seriously, this stuff…I just had it with dinner, but I already want more! 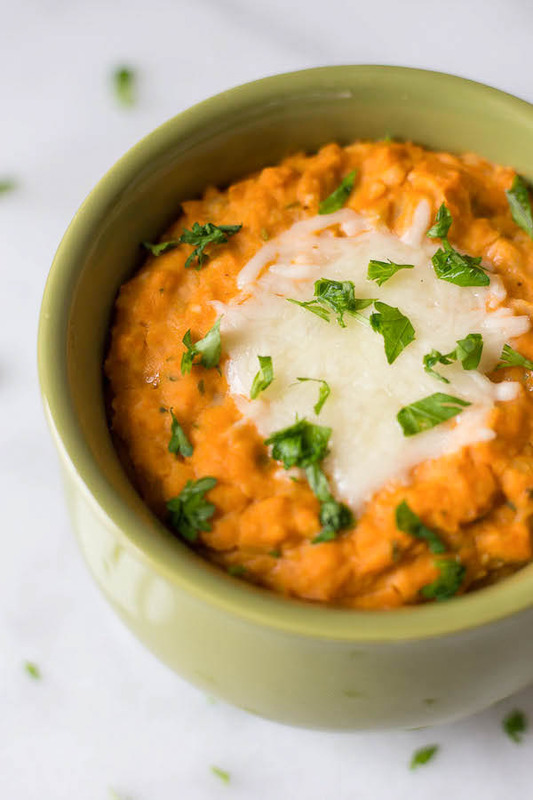 This Healthy Buffalo Chickpea Dip is a big freakin’ deal. 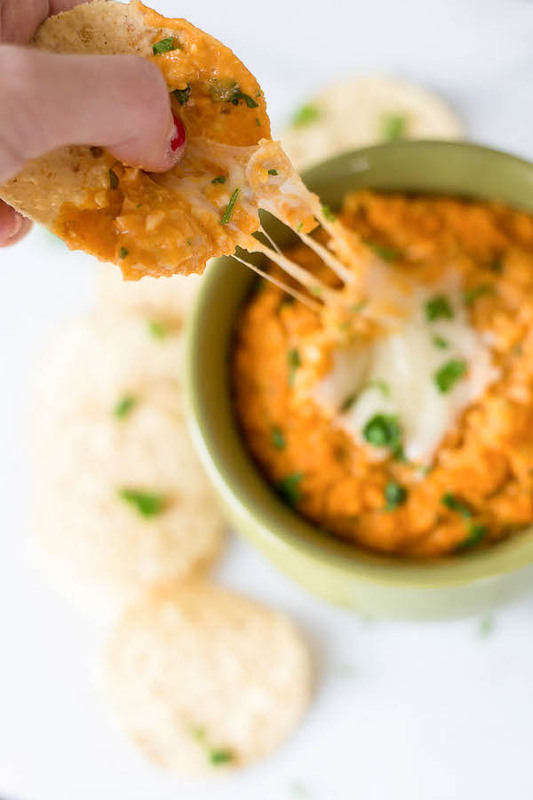 Gone are the days where vegetarians and vegans alike would pine over that cheesy, melty, spicy buffalo chicken dip; this Healthy Buffalo Chickpea Dip is here to make all of your dip dreams come true. Add hummus, hot sauce, garlic, parsley, and cheese to a food processor, and blend until smooth. Pulse in chickpeas until the mixture is chunky and the chickpeas have broken down a little (you’ll still want a little texture here). Top with fresh parley, and serve with corn tortilla chips or carrots! *Baking time will depend entirely on your baking dish! Just keep an eye on it and use your judgement! Okay, this looks seriously yummy. And that cheese pull shot…mm. Yes. SERIOUSLY, Lucia! I love this stuff! 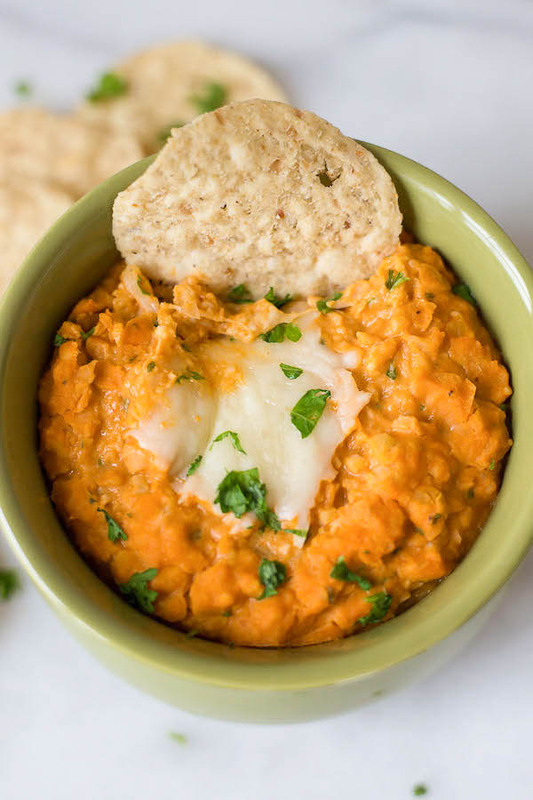 Buffalo Chickpea Dip!?! Man, you’ve outdone yourself Alexa! I’m totally trying this over the weekend. YAY! Liz, you MUST! Please let me know how you like it!! I’m sure you could, Cherie! I just had some hummus laying around, so it saved me an extra step! I’d suggest mixing in some tahini, lemon juice, salt, pepper, and a little more garlic and seeing how it goes from there If you do go the whole “make your own hummus” route, be sure to report back here and tell me how it tastes! Alexa!! This is what party food is all about, girl! This sounds like the ultimate in ‘you’d never know it was healthy’ recipes… which happen to be my favourite kind of recipes. Pinnnnned. Right?! Right there with you, Rebecca! Party food is bae <3 Thanks for pinning! Oh my gosh Alexa, this looks freaking insane! I can’t wait to try this. I’ll try to sub nutritional yeast! YES! DO IT! Let me know what you think, Emilie! This recipe is genius! I love adding Frank’s to pulled chicken but I’ve never thought to add it to chickpeas for a hummus dip! Can’t wait to make this on Super Bowl Sunday! Oh my gosh! This looks amazing! Sounds like a huge hit! Thanks for sharing it with us. Also, this is the first time I’ve found your blog and I love it!! I can’t wait to read more! Hope that you’ve had a awesome weekend!! Thank you SO much, Cailee! You are so sweet :) I hope you had an awesome weekend as well!! OMG. Someone please stop me from drooling everywhere. I put buffalo sauce on literally everything. I can’t wait to try this!! YAY! Me, too! I’m glad there’s someone else out there like me ;) If you try it, let me know! I want to take this to a potluck. Do you think I could do it in the crockpot? Maybe I should bake it the night before and then transfer it to a crockpot for the lunch potluck the next day? I love this recipe and I think its a great alternative to Buff Chick dip, and is awesome for football Sundays. I am also a plant-based veggie eater and would love to share this with my readers with a link back to your blog for the recipe. So glad you like this recipe, Megan! You can definitely link back to this recipe on your blog (I just ask that you don’t republish the full thing) :) Thanks for the support! I am definitely trying this. Has anyone topped with Blue Cheese? Or mixed some crumbles in? Cool idea, Christine! I don’t know of anyone trying to top it with blue cheese, but I’d love to know how it turned out! I just might have to try this. I have cans of chickpeas here anyway and I might try making my own hummus like someone else mentioned. I like blue cheese with buffalo sauce so I’m wondering how that would taste in place of the mozzarella. Of course, then I’d miss out on the stretchy gooey cheese! Oh I bet blue cheese would be great! I’m not a fan, but if you like blue cheese with spicy stuff, go for it!